Last Christmas vacation I had this seriously lucid dream that I was in a Hawaiian movie wearing this knock out tiki dress, drinking coconut cocktails with Elvis and a t-rex. Upon waking from what I think we can all agree is possibly the best dream ever I became obsessed with making a tiki dress. 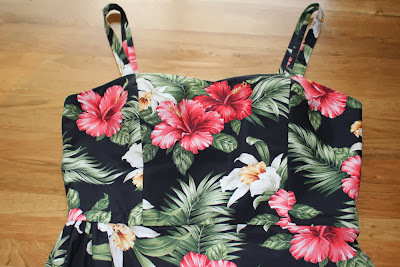 After a call out for help on twitter I was set with some fabric (from Hawaii, natch! ), a pattern (Gertie’s bombshell course) and supplies (boning, casing and the likes sent all the way from NYC by the lovely Charlotte). It was time. But life isn’t all cocktails with Elvis and dinosaurs. Things happened and tiki frock got sidelined. That is until the recent radness of Frocktails down in Melbourne. 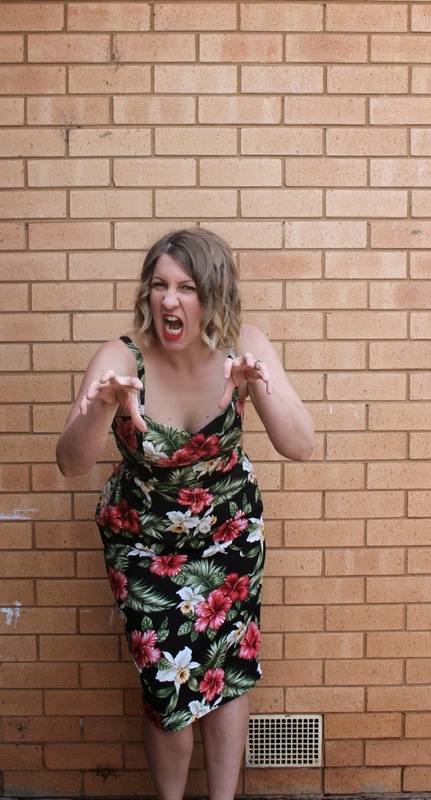 30 rad sewists, 30 rad frocks- I needed to step it up. So please say aloha to awesomeness! I am still in a little shock about the fact that I made this dress. I ended up with 16 days to get this made and most of my evenings and weekends were booked up with TAFE classes, social events and even a derby bout. Craziness. And let me be honest- whilst Gertie’s dress was my inspiration this is more a hat tip to it rather than an actual bombshell. In fact the tiki dress is an amalgamation of three commercial patterns and a self drafted section. Yup. Things got crazy to get this done. I watched all of the bombshell classes and even got the muslin of the bodice made up. But when it became apparent that the ole bosoms weren’t going to fit without SIGNIFICANT adjustments I had to look elsewhere. Enter Vogue 8849. Princess seamed, custom fit cup sizes and boned? That’s a tick in every box. So after ponying up $23.50 for the freaking pattern (I know, I know – it was desperate times) I slapped a toile together like a boss. And then again. And a third time. Fourth time proved to be a charm and I was ready to cut into my shell fabric. Because Gertie’s teachings were still fresh in the noggin I even underlined like a boss. Brace yourself- you’re about to see pieces hand basted together with silk thread. I know, right? Who would have thought I had it in me? The skirt proved to be a bit of a hot mess trial by fire as well. 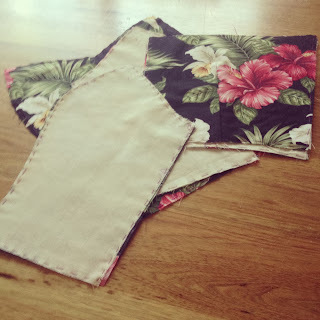 I tried the Burda pattern that came with the Gertie course and it failed miserably. In the end I went with three patterns for the skirt: I used the four piece panelling in the back from the Burda pattern and shaped the panels to fit my epic Simplicity 2154 pencil skirt pattern pieces (kind of like a block, I guess?). And the third pattern? Well, that would be me slashing and spreading the bejeesus out of S2154 to turn the front panel into a sarong skirt. Yup- I drafted my own sarong skirt front using a slash and spread method suggested by a bunch of rad twitter ladies (thanks, Rach!) I also added a killer kick pleat to the back so I could ninja kick assassins if required walk like a lady. Now this bodice top is zero ease. Nada. And I have to admit as I made up my toiles I found the lack of ease really terrifying. What if I laughed too hard at something and my bodice tore all Incredible Hulk style (minus the purple and green)? A legitimate fear, I think we must all agree. But once the boning was added (I chickened out and went with some locally purchased plastic boning for this version) to the princess and side seams that worry went away. Those little plastic strips gave the bodice structure and even held shape when the dress wasn’t being worn. Tragedy struck two nights before I was due to fly to Melbourne. For some dense reason I added a YKK invisible zip. And it jammed. And stupidly I reset it twice before a dim lightbulb went off over my head and was all “zero ease + invisible zip = facepalm. Get thee to a dress zip STAT”. Of course I had no black dress zips so a trip to the fabric store was on the cards for the next afternoon. So the night before I flew out not only was a freaking out about flying death tubes planes but I was doing my second ever lapped zipper, catch stitching the bodice close and blind hemming the skirt. Nothing like a bit of pressure to get you going! Needless to say it was 11pm by the time I was finished which made my 6am wake up not look fun. Aloha morning! The fabric triplets- Kat, Liz and I. Fabric shopping with these ladies was uncanny- but bodes well for stash swapping! 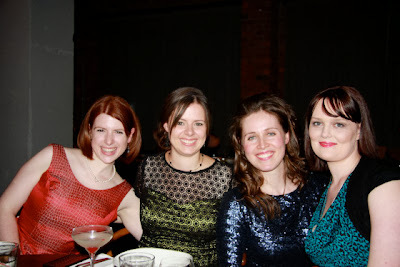 A quartet of Melbourne awesomeness- Belle, Rachel, Mel, Kat. Some serious style (and loveliness) happening at right here. I think it was easy to pick the natural posers in the group… BWAH HA HA! I freaking made it! It will take a while for this thrill to wear off, let me tell you. Bwah ha ha! The special finishing- hand basted pieces, kick pleat, tidy insides. I am so proud with how well this turned out. Hand picked zip. And it held. With zero ease. Consider my mind officially blown. I really want to try the bombshell bodice. I think to do this successfully I’m going to need a dress form. Pinning to a tight shirt did not work so well… Hmm… It may be time to go a shopping! Do I dare go a crazier tiki fabric? I’m thinking serious tiki heads. Sure, I could go refined with a silk or somesuch but let’s face it TIKI BEATS EVERYTHING! Spiral steel boning- I’m ready for this! Overall, I love my tiki dress HARD. The journey of making it was awesome, the learning of new skills rocked my world and I got to kick it with some fab ladies whilst wearing it. But most importantly it passed the greatest test: ability to do the robot. You made HOW many muslins? Woman, you just earned my highest respect. I knew this was an epic dress (you rocked it) but reading up on it’s creation story makes me feel connected to it. 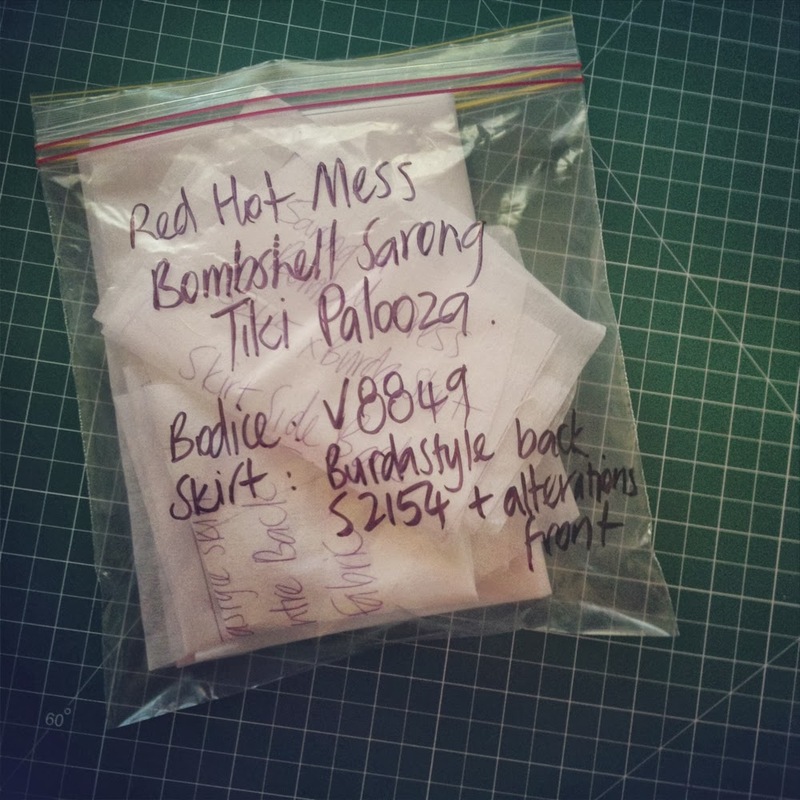 I’m hearing ya on the bodice of the burda bombshell though… it’s the only thing keeping me from actually carrying out that Craftsy course. The Vogue bodice is uber flattering on you though – you look(ed?) hot!!! Awesome. Amazing. And hell yeah for tiki heads! Seriously. This dress is fabulous and worth every bit of silk thread, zip grief and late nights. Bravo! The robot becomes a tough competition to the t-rex 😉 You look amazing in this beautiful dress and red lipstick! Aloha! I love everything about this. And I honestly prefer it to the bombshell pattern. 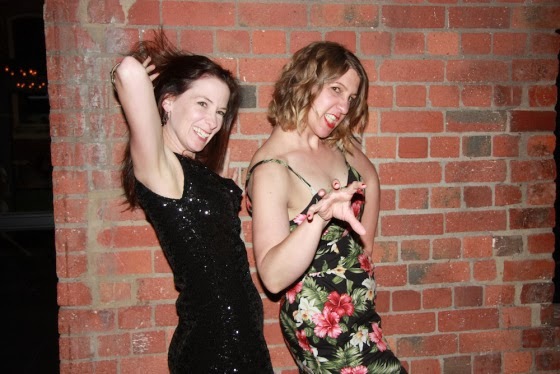 Looks like you had a great frocktails! I have to ask… Was Elvis riding on the back of the t-rex in your dream? dream becomes reality. amazeballs. love it. Oh wow, that’s fabulous! I am in awe of your skills! Franken-patterning like a boss and self drafting. And boning too! Just wow. Oh too too fabulous… you’re killing me! 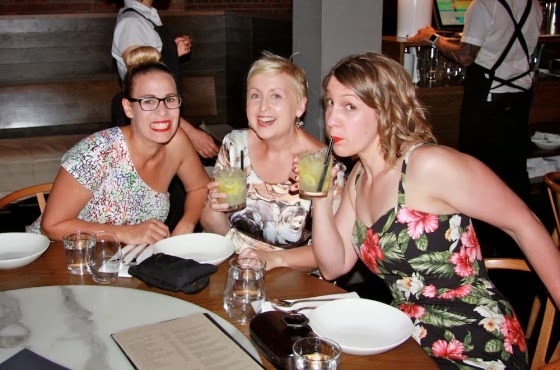 how I wish I lived close enough to Melbs so I could join you bunch of gorgeous sewing gals for frocktails too. And, can I live in your dreams, please? Good lord, you look amazing! And you hand-basted underlining like one of those fancy people who does that? I can’t even. Gorgeous! I’m so impressed at your mad fitting, boning, and hand sewing skills; like a boss indeed! That is gorgeous, a perfect fit! And I’m happy to hear it passed the robot test! LOVE IT. Those are some amazing fitting/improvising skills you have there, lady. What a killer finished product! Gorgeous! best robot sporting a tiki dress ever! Awesome. Impressive. Stunning. Love it. You are the boss! That is one amazing dress – like a boss, lady! Well done!! Wow! I didn’t realise you were so under the pump to get it done. New techniques & deadlines will always result in an ACTUAL hot mess for me so hats off to you for a resounding success! Much respect! Go you Robot good thing. So glad you finally posted the dress! Wow you are amazing to make this (and under such pressure). Got to up my skills a bit. Thanks for the inspiration! Thank ye, lovely! I must admit- I may never go back to invisible zippers again. By the third zipper install attempt I had to literally walk away from the sewing machine and stand outside because I was so vexed. Dress zip was instant win. Who knew? I know, right? This may never happen again in all honesty. But for a brief evening I was like a sewing champion. There was a sweatband and everything circa 1970s olympic games! Cocktails with Elvis and a t-rex should feature in every lady’s dreams, I feel! Frocktails was all kinds of amazing – there is talk of a 2014 being kicked around!!! OMG yes! You need to make a tikihead bombshell- this would be the best thing EVER!!!! So awesome! Merci, lovely! I am afraid the t-rex was standing round the bonfire with Elvis in my dream. Though I can’t recall if the t-rex had a cocktail? I mean, how would he drink it with those teeny t-rex arms?! OMG yes! There were so many rad skills in this course- I want to go back and watch it all again without crazy pressure. So much awesome in one video series! Merci, lovely lady! We should have a rad tiki head dress challenge- so fierce! Bwah ha ha! I am the muslin queen! I am now determined to try the bombshell bodice if only to prove to myself I can- I get so stubborn sometimes! Thanks, lovely! I am so happy with it! Aloha! Merci, lovely! I say give it a bash- the course is in tiny steps so it’s not overwhelming! Next time I am Sydney way we should catch up for a beverage in our fancy dresses- too fun! Absolutely gorgeous! And you can’t beat a dress you can robot in. Aloha!!! That my friend is one fabulous frock. You totally rocked it! It was so lovely to meet you at frocktails. I suggest we make a list of standards for frocks, and not as boring as ‘must be made of fabric’ or ‘must be worn by a (once) living being’. You know how much I already love this dress. But the story of how is came to be is fantastic, I can’t believe you persevered with so many muslins, GO YOU!! I totally get you on the Bombshell cups, those things worry me, how big are they going to have to be? I have a dress form, but it is nothing like my shape even though the measurements are right, so I don’t see that helping. Amazing job on the dress, and totally loving the robot dance!! Looks amazing and rightly so you put a lot of effort into it!! Now get down with your bad self Mrs. Roboto! Woot woot!! Go robot dancer! Lol. Love your gorgeous summery dress. And, looks like you had a blast at the meetup. The cups are seriously hellacious! But I think we can do it- I forsee a challenge ahead! Merci, lovely! And it was all kinds of rad to catch up. Team Chacha! Thanks, Mela! I think robot dancing should be an essential requirement to all creations! Spectacular! Now you just have to find Elvis and the T-rex for a cocktail. Um ya! Clearly we can’ t be the only people that know this??? I figure this should be included in all learn to sew books. Chapter One: Equipment. Chapter Two: Raptor and Robot Testing. Duuuuuuuuuuuude! Love everything about this post and this dress! F*CKING FABULOUS!!!!! Bwah ha ha! Epic sassy robot tiki dress win! Thanks, lovely! Next Frocktails we are so catching up! Oh, dear Lady! You are the only person who can be elegant like a robot making and wearing this dress at a time. Love your adventures to get to complete this dress, love your dress (wonderful) and love your sense of humor. You are unique! Lovely, lovely dress and a super read! Awesomeness! I’m hoping to head to Sydney closer to Christmas or early new year- I foresee fun times ahead!